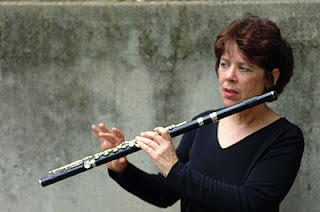 My love of Latin flute music has been nurtured by the sense of possibility that came from my Powell wood flute. The feelings I have about this flute run pretty deep. I literally fell in love with this flute at the Columbus NFA Convention in 2000, and played it nonstop at all my gigs--orchestra, jazz, chamber music, concertos--everything, for several years. I really loved the way I felt like I was playing an oboe or clarinet sometimes, and the blend with the other woodwinds was different from the experience of a silver flute. The 3rd and 4th octave high notes were clear, focused and in tune, certainly much more so than some other wood flutes I tried out. Also, there was a mutuality that I felt while playing it, in that the warmth of the wood was constantly giving me something back. I have been playing the flute for over 45 years and for many years, improvising and playing in jazz groups. My latest CD, Tocando Juntos, was recorded by Primavera Latin Jazz band. This group formed 2 years ago at a time in my life when I was ready for a new musical direction. The band members met initially at Berkeley’s Jazz School, in an ensemble class on Afro Cuban Jazz. This was love at first beat—the sound of the wood flute with all its dark warmth and richness, coupled with those rhythmic percussive hits in the high range, floating over the sound of claves, congas, piano and bass was just so irresistibly hypnotic, not to mention appealing to the flute diva in me. Unlike the jazz idiom, where sometimes as a flutist I felt like a visitor, in Latin jazz the flute is queen--every solo a mini concerto of coloratura rhythmic flair. In Cuba, there are still some charanga flutists are playing 5-key wooden transverse flutes (labeled in the 50’s and 60’s “charanga flutes”) effortlessly popping out 4th octave E’s and F’s. Once I started digging seriously into Latin American music, it became clear to me that my feeling about the relevance of playing the wood flute is reflected in history—Cuba and Brazil were populated by Europeans from Spain and Portugal in the 16th century. The Europeans brought their instruments and music with them, including baroque and classical styles, later to be synthesized into a version of dance music created by the fusion with African percussion and rhythms. The barons of the sugar and coffee plantations in these countries educated their slaves in the traditional baroque and classical styles (Lully was a favorite in Cuba) to entertain at balls and social gatherings. Pixinguinha, one of Brazil’s greatest composers of choro music and grandson of slaves, was a virtuoso classical flutist, a child prodigy. The synthesis of these cultural styles created beautiful and sensual dance music, including charanga and choro, paving the way for the evolution of samba, bossa nova, mambo, cha cha, salsa, and other more modern styles.